Try this 2D shape matching activity from the website ABCya! This site has some great basic information about 2D and 3D shapes. 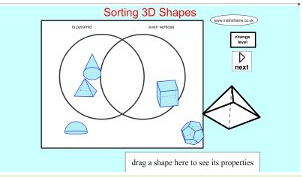 This site has lots of information about 3D shapes. It nicely highlights the attributes (faces, edges and vertices) of different prisms and pyramids. The shapes rotate and there is lots of good information. Check out these Math Frames activity. 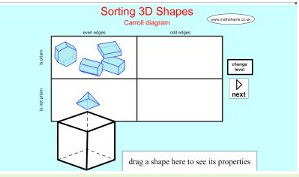 Practice sorting the 3D shapes using the Carroll diagram at the left. 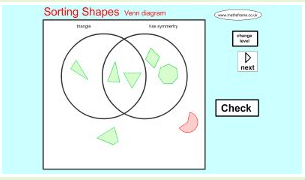 You can also practice sorting 3D shapes using the Venn diagram on the right. You can choose the attributes to sort by. Math Frames 2D sorting activities. 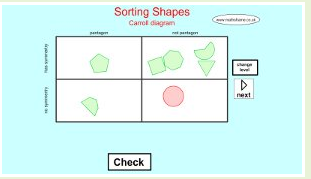 Choose to sort using either a Carroll diagram or a Venn diagram. You can choose the attributes to sort by. Math Frames - Carroll diagram to sort 2D objects. The Carroll diagram is missingthe sorting labels. Can you determine the sorting rules?